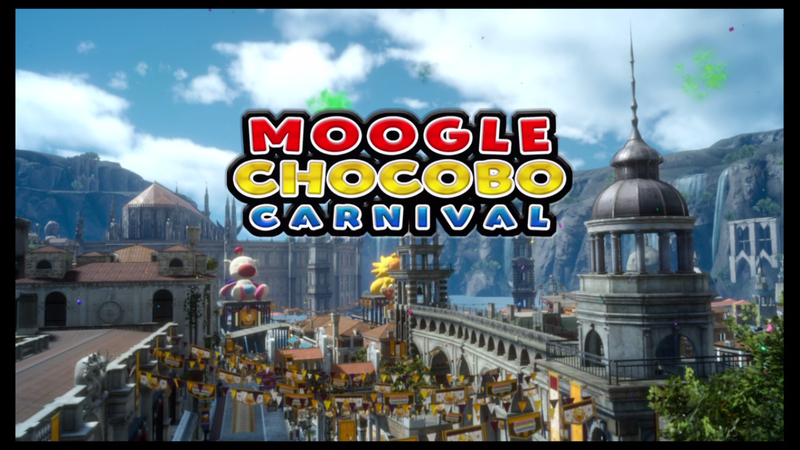 While most people have finished with Final Fantasy XV, Square Enix is inviting people to come back and play in its world again with the Moogle Chocobo Carnival. The free event is a playground of Chocobo and Moogle mini-games for some good light-hearted fun, a noticeable departure from Noct’s dramatic story. It’s also totally spoiler-free, allowing players to jump in and have fun at any stage of the story. I've technically finished Final Fantasy XV (review on its way! ), but I haven't stopped questing and letting my inner completionist run loose in Eos, so I didn't hesitate to download the Holiday Pack DLC and enter the restyled version of Altissa. But I understand that other players may need a bit of a push, so here my thoughts on the DLC to help you decide whether you want to join in on the Moogle Chocobo fun! Final Fantasy XV Carnival features the kind of minigames that took up my end game time in Final Fantasy X, X-2 and made a small return in World of Final Fantasy. 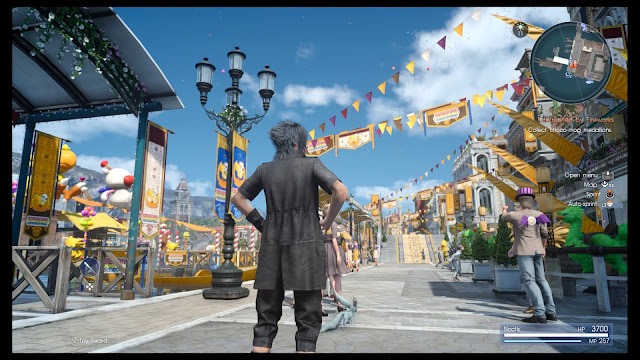 There’s Chocobo racing, finding Chocobos around the city and a new real-time photo mechanic among other things. My favourite mini-game was a decoration one that involved decorating an area based on a riddle that cryptically described whether I needed to put down a Moogle or a Chocobo, which I enjoyed carefully reading again and again to find what I need. The mini-games are all totally silly and that's what’s great about them, especially since Final Fantasy XV’s core story is quite serious towards the end. I especially liked how some of the moments gave me a look at a happy Noctis, something I didn't realise was shown so little in Final Fantasy XV’s core story. With everything he goes through in the main story, it genuinely made me smile seeing him do silly things in a ridiculous costume. Since I've finished Final Fantasy XV, I'm well past the phase of feeling disconnected between the dire feeling of the last few chapters and into the end game exploration part. But I'd be seriously concerned if someone played this Carnival through the infamous chapter 13 - I feel like it would really kill the tense vibe that should be carried through that chapter. I would exercise caution if I was someone in the last few chapters of Final Fantasy XV, but that may just be my personal preference for playing through story content. I like Noctis, but I love the group of guys together more. As soon as I heard the words Chocobo and Carnival together, I thought of Prompto’s love of animals. 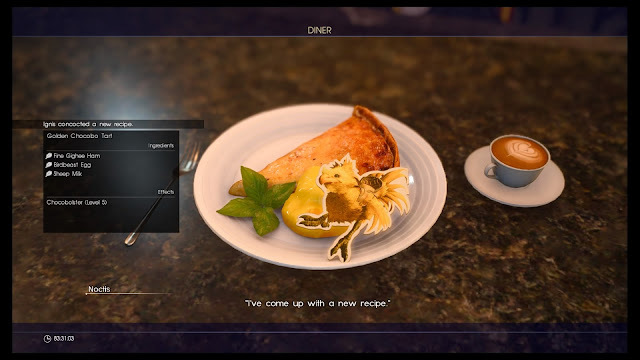 And there would be so many recipes for Ignis to find there, and so many weird moments for Gladio to tease Noct about. But the event seems to understand this, so Noctis makes his own amusing jokes and is given the adorable Carbuncle as his new companion. Noctis is surprisingly hilarious when he wants to be, with his awkward dancing with Moogles and his Ignis impression (complete with spot on “recipeh”) making me genuinely laugh out loud. It's a compliment to Final Fantasy XV how much I missed the group together, but they did a pretty good job making up for it with Noctis. There are more side quests than I could complete in my first day with the Carnival (granted I only played a couple of hours), which makes me incredibly excited. Final Fantasy XV has been a questing playground for me, so having even more to do in a limited time is slightly overwhelming but awesome and I plan to complete all the quests before the event is finished. I completed the main quest of collecting enough tokens for the nice hotel room and view of the fireworks and was rewarded with a cute cutscenes, but I get the feeling that's most of what I'll get. I'm not too bothered by this since I've finished the main story and I'm sure we’ll get more moments with the guys in their individual Episode DLCs, but if you care more about story than quests, this probably isn't the DLC for you. As for me, I'll take running around doing new quests with Noctis on top of a bird any day. 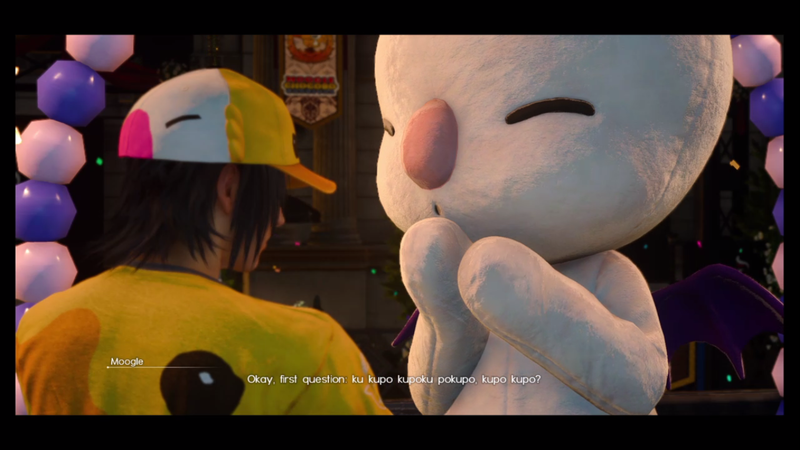 The Final Fantasy XV Carnival is an adorable tribute to two of the most well-known mascots in the Final Fantasy series. Questing fans like me will probably love the amount to do in the festive version of Altissa and meeting Noctis’ fun side is a nice cherry on top of the experience. I'm happy to have an excuse to play more Final Fantasy XV and hope Square Enix considers more of these kinds of events in the future. 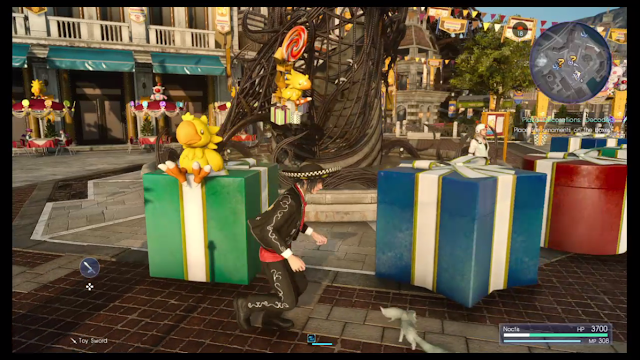 To play the Moogle Chocobo Carnival, make sure to download the latest patch for Final Fantasy XV and get the free Holiday Pack (or the Holiday Pack+ if you're a season pass holder) on PSN or the Xbox store. Will you play the Moogle Chocobo Carnival? Are you still playing Final Fantasy XV?